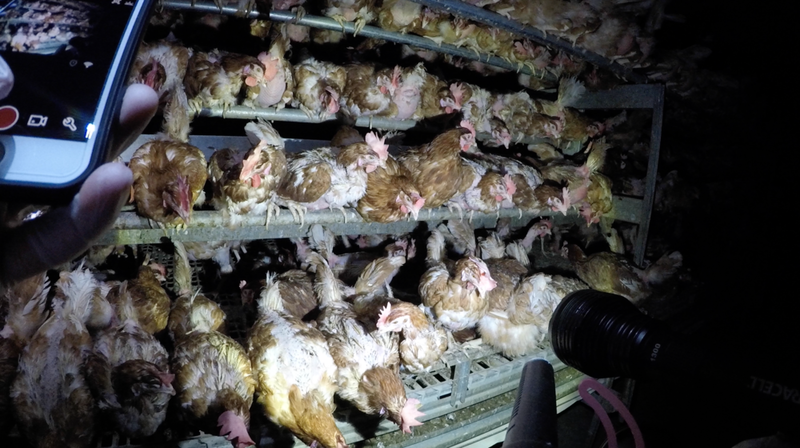 Ella was being eaten alive at a cage-free egg farm. Until the DxE Open Rescue Team arrived. Cannibalism is rampant in the crowded, starved conditions on cage-free farms. Ella’s feathers and sensitive sexual organs were viciously attacked. With birds and excrement everywhere, the air becomes so toxic that birds struggle to breathe. Ella and her sisters struggled for every breath. Mortality on cage-free egg farms is up to four times higher than in other facilities. Dead birds pile up on the farm. The DxE Open Rescue Team quickly identified Ella as a distressed animal, based on her loss of feathers and injuries. We rushed her to receive medical care. Costco and other retailers claim their cage-free farms are free of fear, discomfort, and suffering - but in fact Ella lived in sickening conditions. 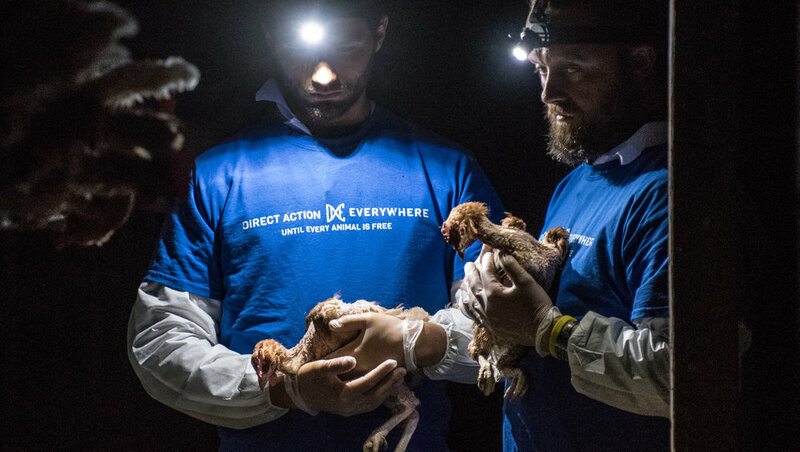 The DxE Open Rescue Network has empowered ordinary people to enter farms and rescue dozens of animals from violence. Will you join us? Many hens at this Costco cage-free egg supplier’s farm can barely move. DxE animal rights activist Jason Oliver rescues injured bird from farm. Jason Oliver and Paul Darwin Picklesimer with two injured birds at the Costco cage-free egg supplier’s farm. Sick bird at a Costco cage-free egg supplier’s farm. Many hens go blind after their eyes are pecked and damaged. One of many dead birds found among the living at Costco cage-free egg supplier’s farm. This hen is missing most of the feathers on her back, the victim of attacks by other birds at the Costco cage-free egg supplier’s farm. One of many dead hens found among the living at Costco cage-free egg supplier’s farm. DxE animal rights activist Jason Oliver passes injured hen through fence to activist Diane Gandee Sorbi, so she can be taken to a vet. Many hens have swollen, infected crops that prevent them from ingesting food. They slowly starve. With emergency veterinary care and careful 24/7 nursing, Ella is on her road to a full recovery. But there are countless more birds just like Ella being hurt by Costco. Will you step up to help them? Veterinary care, equipment, and campaigns are expensive. We can only save animals like Ella with your help!